Since comprehensive covers damages not caused by a collision, we first have to define what a collision is. A collision is defined as upset of your vehicle or impact with another vehicle or object. Claims that are caused by hitting a bird or animal are the one exception to the collision definition, as those are covered by comprehensive coverage. 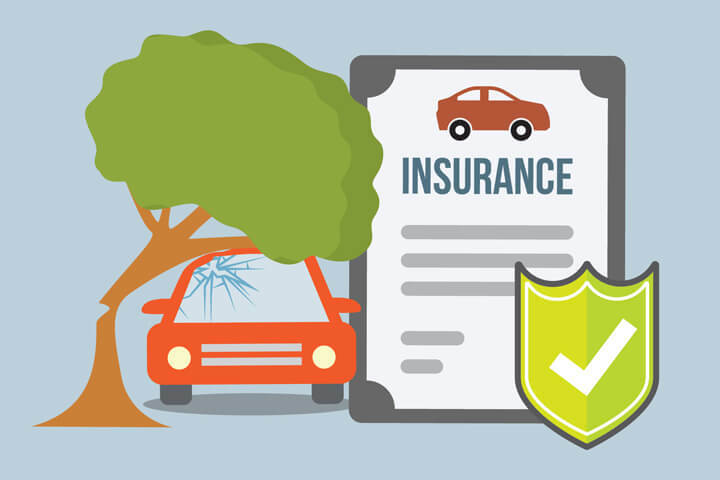 Let’s take a look at some example claim scenarios and how your car insurance policy will respond. Chances are your vehicle sustained damage to a window or door lock, as well as the theft of the radio. Comprehensive coverage will pay for the repairs to your car, as well as replace the radio. This is similar to the first scenario, but the coverage is different. Comprehensive will pay for damage to your car from the break in, but your laptop will not be covered. The reason for this is due to the exclusions of a personal auto policy. Personal items like cell phones, computers, and purses are specifically excluded from coverage. If you have a homeowners or renters policy, you most likely have coverage for off-premise personal items, but any loss is subject to the policy deductible, just like with comprehensive coverage. Since comprehensive covers impact with an animal, it will pay for the repairs to your car. The damage to the fence will be covered under the liability coverages on your policy, specifically the property damage liability. This type of loss is excluded from coverage due to an exclusion for freezing. There is an expectation that you will take the necessary precautions (like adding antifreeze) to prevent this type of loss. Comprehensive will not cover losses due to mechanical or electrical breadown or failure. This claim would be covered by comprehensive coverage. But if it was your neighbor’s tree, and you can prove the branch was previously broken and needed removed, their homeowner’s liability insurance may have to pay. These claims are definitely covered under comprehensive insurance. This is covered under the breakage of glass provision in the comprehensive coverage. There is a specific exclusion when you use your car to practice or participate in an organized racing contest. This claim will be denied under your comprehensive coverage. Breakage of glass is covered, but not if the damage was intentional. You’ll have to pay to replace the windshield out of your own pocket. How much does comprehensive coverage pay? Audiophiles who spend thousands of dollars on custom stereo equipment will want to have additional coverage added to their policy. Also, if coverage is provided elsewhere, the company will only pay their share of the loss. Adding comprehensive coverage to your policy will increase the cost around 15-20%. According to the Insurance Information Institute, the average cost of comprehensive coverage is about $143 a year, with the average full coverage policy costing $838. The cost of comprehensive varies by state, however, with South Dakota having the highest comprehensive rates and Oregon having the lowest. Your choice of deductible has a big impact on how high your rate is. Choosing a lower deductible means you have to pay less if you have a claim, but you will pay higher rates for that privilege. Higher deductibles mean you are willing to shoulder more of the upfront cost of a claim, so you will be rewarded with lower comprehensive rates. When buying comprehensive coverage, you select a deductible that you must pay before the insurance company settles a claim. This amount varies, but common deductibles are $250, $500, or even up to $1,000. This amount comes out of your pocket, so it’s important to have adequate savings on hand in the event of a claim. Some people assume that comprehensive covers everything that collision does not, but that is not true. Due to policy exclusions, there are many things that are not covered, and we covered some of those in the prior claim scenarios. As vehicles depreciate, there comes a point where insuring for physical damage does not make financial sense. A vehicle that is 10 years old or older has probably decreased in value to the point where comprehensive coverage is no longer justified. There is a loose guideline that if the annual cost of physical damage coverage (comprehensive and collsion combined) exceeds 10% of the fair market value of the vehicle, then it might be a good time to consider removing those coverages. The decision to remove coverage depends on your situation, and if you do not have the financial resources to purchase a replacement vehicle, you might want to keep coverage in place. It’s better to pay a little each month and know you have coverage than to drop coverage and have the unexpected happen.